We are so excited about this opportunity to partner with Easter Seals. We believe in giving back to the community and empowering our staff to get involved in our efforts. 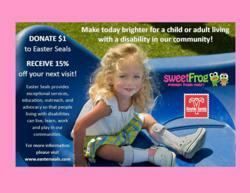 Today sweetFrog® Premium Frozen Yogurt stores in Jacksonville, Florida, kick off a two-week promotion for Easter Seals. Visit your Jacksonville-area sweetFrog® locations now through June 30 and make a $1 donation to Easter Seals. In return, you will receive a 15% off coupon for your next visit to sweetFrog®! All net proceeds from the sweetFrog® promotion will benefit Easter Seals Florida. Customers can support essential disability programs every time they visit a Jacksonville-area sweetFrog® June 16 through June 30, 2013. Eight Jacksonville-area sweetFrog® stores are participating in this promotion and helping Easter Seals Florida create life-changing solutions for children and adults with disabilities. As the preeminent premium frozen yogurt retailer in the country, sweetFrog provides an unparalleled experience with every cup of yogurt. sweetFrog has quickly gained a loyal following due to its wide selection of creamy flavors, fresh topping choices and self-serve model. Led by our mascots, Scoop and Cookie, our stores are proud to invest in their surrounding communities through fundraisers, outreach, and much more. The F.R.O.G. in sweetFrog stands for Fully Rely On God, and our stores demonstrate that by operating as good neighbors in every location they move into. Founded in Richmond, Va. in 2009 by entrepreneur Derek Cha and his wife Annah, sweetFrog has expanded to over 250 stores in America, England and the Dominican Republic. To learn more about sweetFrog, visit its website at http://sweetfrogyogurt.com. Easter Seals is the leading non-profit provider of services for individuals with autism, developmental disabilities, physical disabilities and other special needs. For more than 90 years, Easter Seals has been offering help and hope to children and adults living with disabilities, and to the families who love them. Additionally, Easter Seals has provided critical community-based supports and services to military service members, veterans and their families since World War II. Through therapy, training, education and support services, Easter Seals creates life-changing solutions so that people with disabilities and military families can live, learn, work and play. Support children and adults with disabilities at http://www.easterseals.com.